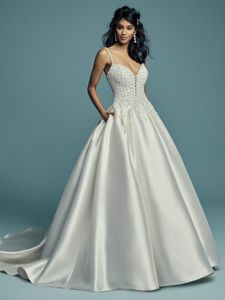 Description: Delicate beaded motifs adorn the bodice of this Elodie Mikado princess wedding dress, drifting into a billowing ballgown skirt with pockets. Beaded spaghetti straps complete the illusion plunging sweetheart neckline. Finished with crystal buttons over zipper closure.